This December we will be in a series of messages called, “The Gifts of Christmas.” Each Sunday we will focus on one gift. The good gifts Jesus came to bring us are hope, love, joy, and peace. 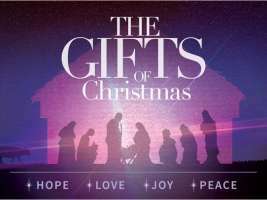 The gifts of Christmas are all received by faith in the Lord Jesus. Peace is the gift keeps us in Him. Our personal peace with God is something that comes when we let go of our pride and come to humbly worship the King Jesus.